On Saturday, February 11th, students from Jeff Rice's A&S 100 class joined me at the indoor winter Lexington Farmers Market. We set up two tables, two digital audio recorders, and one scanner. For five hours, we conducted many interviews with farmers, vendors, and market supporters who had been affiliated with the Lexington Farmers Market since 1972. 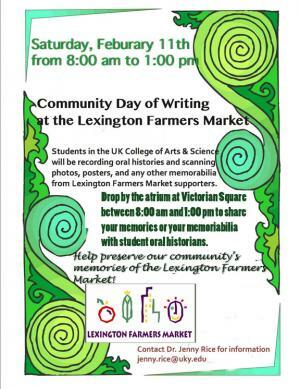 These interviews helped us to understand how something like the Lexington Farmers Market comes into being. Former Mayor Pam Miller told us how she struggled to get local farmers interested in selling fresh fruits and vegetables. At the time, farmers were much more invested in tobacco farming, which was a more lucrative endevour. As tobacco farming became less attractive, however, farmers turned to venues like the Farmers Market for a new way of doing business. These kinds of "pop up" events are a great way to set up instant engagement between community sites and students. We look forward to many more such events in the coming year.